Looking back at earlier posts that I made I came across an idea that got tossed to the side. The footie pyjamas. In all the chaos of the previous year I completely forgot. I think I might order up some Calmer and give it a whirl. The dress didn't take very long (once I took a deep breath and let the knitting do it's "thang") and I'm hoping I'll find the same of the footies. "G" has already outgrown the dress. I might make her another, but this time modify the neckline to bring it in a little more because it had a tendency to fall off her shoulders (a little too cheeky for a five year old). The footies will be for my boy. He recently outgrew his last pair of footies and cried for several hours because he couldn't wear them (he's tactile and falls in love with his clothes and blankie..... he's my Linus). It's near impossible to find footies in sizes larger then 3T so if you can't find it, then make it. How much longer is the create a long going for? Is it indefinite? Either way I hope I can get the footies done before the time out. Hello all! Sorry to have been missing for so long from all the action, but this summer turned out to be a bit crazier than usual. Anyway, I thought you all might like to know that my "Crochet Crop Cardigan" pattern that I created as part of the CAL is done! The CAL was a terrific resource. I received great input during the design process as well as I found two test crocheters (weaverknits and sally) through the CAL. 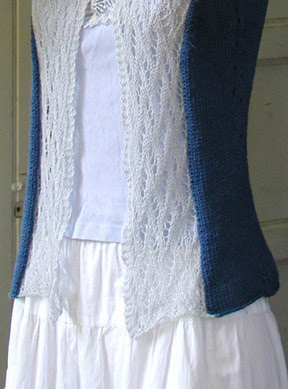 They have some great photos of their cardigans on ravelry. Thanks so much for all your suggestions! This pattern is available for free here . And, if you happen to have any tutorials of your own, please let me know. In my last tutorial, I cover creating simple lace charts in Excel. Today, we'll approach a more complex lace pattern and introduce the no stitch. 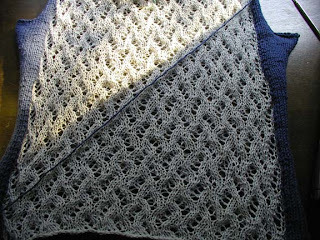 The lace pattern, I'll be covering, is most of the Peri's Parasol pattern I used in Chapeau Marnier. What is a "no stitch"
More than any other single question, I get this most of all and I think it boils down to a lot of over thinking from the knitting community. Often, people ask if it means a stitch should be slipped. A no stitch, in fact, simply means there is no stitch in that spot. Some lace and cable patterns, change stitch count from row to row. The chart can be made a little more intuitive by distributing the stitches in a logical manner and spacing them with "no stitch" blocks. Generally, when using a "no stitch," one should format it in such a way that it can easily recede from focus. I usually shade mine in gray or black. Set the alignment to be centered both horizontally and vertically. One of the things that can be hard about converting verbose instructions into charts, is ensuring you always have every stitch accounted for. This can be particularly tricky when there are a lot of knit stitches (which I generally work as blank boxes) and the stitch count changes from row to row. To alleviate this, I use conditional formatting to format all cells as "no stitch" cells unless I input a character. I use spaces for knit stitches. You'll see that up ahead. To launch the conditional formatting options, with all your cells selected, go to the FORMAT menu to CONDITIONAL FORMATING.. This will bring up a dialog box. In this case, I'll say that all cells that are equal to zero  should be formatted in a special way. I'm also going to go ahead and indicate that all cells that are equal to a minus sign [-] are shaded blue. These will be purl stitches. Set the PATTERN to a light gray or whatever you want your background to be. Go to the BORDER tab and turn off all the borders, if you like, or make them a lighter color. For the purl stitches, set your conditional format so that all cells that are equal to a minus sign, get formatted. Click the FORMAT button and set the background to blue. Do not change the font or border tabs, this time, just click OK.
Click OK once again to exit the Conditional Formatting window. Your screen should look something like this. Note that even though you haven't typed anything in yet, all the cells are gray with no borders. This is the conditional formatting. Add your row counts. I had to widen those columns a little to fit the text in. You'll know you need to do the same if you get pound signs instead of the numbers you expected. I am leaving lots of space between my row count columns, because I know my stitch count will change but I'm not sure by how much. The first couple rows are free, the next ones will cost you. As I indicated before, knit stitches are formed with spaces, all other stitches just employ the code found in the key. The first row was pretty straightforward and its subsequent follow up row, which is just worked in the established k/p pattern. But as I continue to add rows, I see that the chart symbols don't seem to align in any meaningful way. Even though every row starts at the same point on the right, they rows grow vastly out of sync by the time we get to the left. So, here we see all the symbols that I'll be using in this particular chart. I can start to shift the symbols around. a little hand. Now you can drag that group of cells wherever you like. The purl areas, indicated in blue, decrease as you move up the chart. I decided that the blue areas should align to along their left edges. You can certainly choose otherwise. In order to do this, I'm adding additional NO STITCH blocks into the middle of the chart. You can really see how this begins to build up the shape of the stitch pattern. Once all my stitches are aligned, the chart really seems to make more sense. The end result will look like the scalloped edging on the hat. This pattern can also be set up so that the left edges align and the right edges align and additional no stitches fill in the space to the blue areas. Some charts will lend them selves more logically to a certain format, than others. The nice thing about using a computer is that you can keep playing until you are happy with the results. People run pretty hot and cold, when it comes to the topic of charts. Personally, I'm a big fan of them, and when it comes to lace, I find it nearly impossible to work without a chart. If you saw my knitting notebooks, you'd see that, no matter how simple or complex, I always chart my lace patterns out. If you enjoy working from charts or if you ever need to create a chart for a pattern, you can produce good clean results with spreadsheet software like Excel. I've created several tutorials in the past, which you can access here. This tutorial will use some of the same techniques I've covered in Using Excel to design colorwork and Using Excel to aid in writing multi-sized patterns. If you haven't seen those tutorials and you aren't comfortable using a program like Excel, I suggest you browse them to get the basic concepts of working in Excel. I've chosen a very simple lace stitch pattern, designed by Dorothy Reade, which I'm using in Donna Druchunas' upcoming book. Here are the verbose instructions. These instructions could be compressed even further, as the foundation row, 9, and 13 are all identical and 1 and 11 are identical. Even so, I find it hard to use these instructions to visualize what I'm doing. I also find that it takes me longer to memorize a lace pattern if I can't see it charted out. Select all the rows and cells in your Excel sheet and adjust the size of the cells to mimic the shape of a knit stitch. If need be, refer to the colorwork tutorial for more information on how to do this. Based on the verbose instructions, I see that the +7 is made up of one stitch at the beginning of the row and 6 at the end and that there is a foundation row and 7 public side rows. Because I know this, I can number my rows and add grid lines. just begin charting your lace, and go back add the row and stitch counts and your grid lines, later. There is no need to download fancy schmancy knitting fonts. You can communicate with your standard set of characters. See the key above, to see how I've translated the stitches to letters. Use characters that will make sense to you. I like a blank stitch for knit, "t" for "twist," "o" for "yo," and slashes and a carrot for the decreases. Don't like that? Do something different. I won't hate. The first row in which we have a reason for those extra 6 stitches at the end. While the main pattern repeat requires a double decrease, the first and last decreases of the row will be single decreases. You will be able to see this more clearly when we get to the end. Complete the pattern as indicated in the verbose instructions. Whenever I can, I like to copy and paste, duplicate stitches and rows. Do whatever works best for you. Double check your work, going stitch by stitch from text to chart. 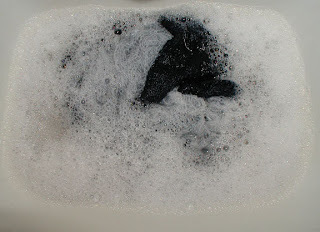 The end results are neat and clean, but would probably cause confusion. It's not clear where the pattern repeats begins and ends. Just select the stitches you want to outline, and choose a thick border to outline it. You can choose a custom border by going to the FORMAT menu and choosing CELL. Finally, to make the repeat really obvious, shade everything that only gets worked once per row. This makes the repeat really clear and visually indicates the secondary elements. 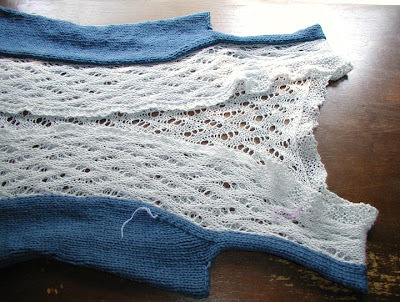 I think that you'll find that many lace and knit/purl stitch patterns can be worked up this way. Have fun with it. In the next tutorial, I'll cover doing more complex lace charts and discuss the ever-confounding "no stitch." Click to read about Indigo Flowers I, II, III, 3.5, and IV. 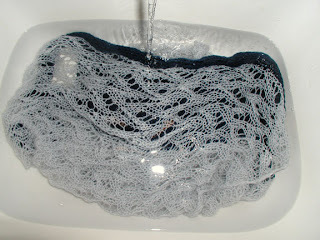 Can you see how joyful the lace is, relaxing in a basin of tepid water? A dollop of rose-scented conditioner leaves a lingering sweet scent on the vest. I know, I should have used orchid or lavender to match the mood of the vest, but I always find rose irresistible. 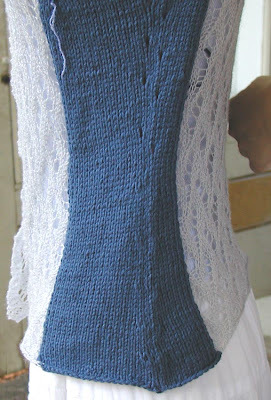 As you can see, the neckline is finished with a few rows of garter stitches and THE bind-off method. Initially I also worked two rounds of seed stitches at the sleeve openings, but Calmer had its own mind (elastic cotton, what can you do), so I ripped them out in the end. It's been so long since I first conceived the design--two and a half months to be accurate. Like many of my fellow designers here, I changed quite a few design elements on the way, so I am more than pleased to see that the original idea has come through (has it ;-)?) in the finished garment. Invaluable suggestions and opinions from fellow CALers, friends and readers have helped me out of several crucial problems, and your encouragements and reminders(!) have kept Indigo Flowers alive ;-). Thank you! Here is my little Sea Witch. She loves her new outfit and looks cute as a button. Thanks for helping inspire me to create this...you all are awesome! Earlier this week, I dug Indigo Flowers (not yet forgotten!) out of my stash and resumed the work. What really surprised me was that the flowers literally flew off the needles--must have been due to the training that I got from the complicated laces! I actually stopped at six rows before the bind-off row so I still have a chance to tweak the neckline a bit. Once again there's a dilemma. On one hand, the wavy neckline should get fixed. On the other hand, a fancy collar won't work since the vest is supposed to have a simple cut. The fact that it will be paired up with a shirt/blouse should be considered as well. What do you think? 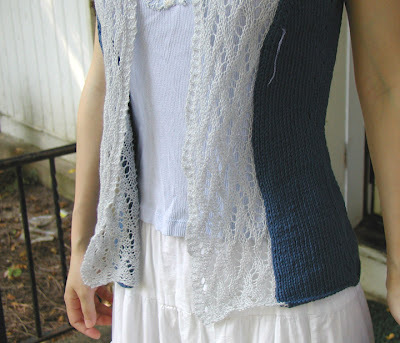 Shall I finish the vest with a few lines of garter stitches along the back and the front neckline and let them fall back leisurely, or shall I do an I-cord bind-off? With Indigo Flowers sitting quietly aside, I picked up my tiny little lace needles--oh how am I obsessed--to cast on a few stitches with my new favorite yarn (THE silk). Yup I am trying a new design, no I have not figured it out completely yet, but that's why we like knitting and designing so much ;-), correct? Finally, having seen how beautiful this (Non-)Pencil Sketch had turned out to be, I thought it might be a good idea to modify the pattern and expand the size range--I just need a little more time! with the subject line, JOIN. All skill levels of knitters and designers are welcome. Document your process, including successes and mistakes along the way. You may design anything at all, including garments, accessories and home decor. All designs must be new and original, no rehashing old designs you've done, unless you are making a variation on a theme. All designs should be done in one of the specified yarns. There is no need to post a pattern and any pattern you create remains yours to do with as you please. Post questions if you have them. Answer questions if you can. Copyright 2007 Please respect the authors' rights to their photos and text, and do not copy without their expressed written consent.